In addition to handguns and handcuff, a growing number of law enforcement agencies nationwide have added body cameras to the list of standard issue equipment for their officers. Since many cameras started recording over the last few years, the public has been able to see what happened during some heated and controversial encounters. Some of the most recent cases in the national spotlight include the 2016 fatal shooting of West Montgomery Resident Greg Gunn by a Montgomery police officer and the 2016 fatal shooting of Alton sterling by Baton Rouge, Louisiana police officers. In that case one officer was fired, another suspended for losing his temper during the incident. In the Montgomery case, which was not recorded because the body camera was not turned on, Officer Aaron Smith is charged with murder. His trial is set to begin in August. Body cams have also captured some heart warming moments of officers serving their communities. Depending on when an officer’s body cam starts recording, it can show you exactly what happened in any situation, and from several different points of view depending on the number of responding officers. That is what Montgomery County Sheriff Derrick Cunningham likes about body cameras. His department has been using them for two years now, and Cunningham says the number of complaints against his deputies has declined. “I really do believe that the body cameras and the in car video cameras would really help law enforcement across the country because you see what’s going on right now, the general public looks at one bad incident and they cast that same stone against all law enforcement and our main goal is to let the public know that we learn from those mishaps as well,” said Cunningham. It’s department policy that all Montgomery County Deputies on patrol and jail officers wear the cameras. Sheriff Cunningham says the department is currently in the process of upgrading its body cameras to a model that automatically syncs up with a cruiser’s dashboard mounted camera. Whenever an officer turns on his flashing lights, the cameras start recording, and when they return to station, all of the video automatically downloads to their servers and burns to disc once the storage drive reaches capacity. “It time stamps it, dates it and it says certified back up number and so all we have to do is go to the file, get this disc and put it back in the system and we can see all of our video footage,” said Cunningham. In neighboring Macon County, Sheriff Andre Brunson is looking forward to role body cameras will play in his department’s law enforcement efforts. 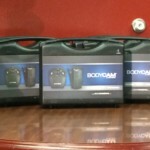 The department recently purchased 50 new body cams. That’s one for every person in the department, from deputies on patrol to the jailers to the sheriff himself. “Working with the community, these cameras are going to keep us honest. You get a lot of complaints on officers and in this day in age with so much going on with police officers I think everybody needs body cameras. You have good things come out of it and you have bad things come out of it, but at least they’re honest,” said Brunson. In Alabama, each law enforcement agency is responsible for crafting its own body cam use and video storage policies. Only a handful of states in the country have state rules and regulations that govern the use of body cameras.